The strike movement that emerged in the late 1970s challenged state intervention in labour relations, thereby linking wage demands with the struggle for democratization. Its focus on worker mobilization and militancy, both in the workplace and in its engagement with national and local politics, created the new unionist movement. Where this movement differed from the unionism that had developed before the 1964 coup was in its pursuit of democratic workplace relations, autonomy from the state, and stronger connections with social movements, working-class communities, and the PT. New unionism’s history of militancy also became a history of political success, which trade unionists continued to reference as a benchmark for successful labour action. 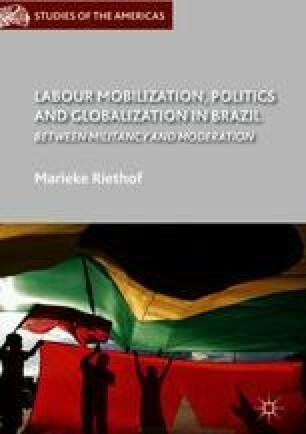 However, as this chapter argues, the struggle to become both a legitimate political actor and a genuine representative of workers created internal tensions between militant strategies and political participation. Memorias Operárias. 2016. Entrevista Gilson Menezes, parte I. Memórias operárias. http://memoriasoperarias.blogspot.nl/2015/12/entrevista-gilson-menezes-parte-i.html. Accessed 11 July 2016.